But "it boggled my mind then" and it made me wonder about the 'state of affairs "today. Monday, November 26, 2007 in The Guardian published an article on "Cultural Guerillas". They thought it necessary to repair Paris Pantheon clock. All in extreme secrecy. It came to light through a lawsuit against Untergunther, for their clandestine restoration. L'UX is a clandestine Paris-based organization whose goal it is to improve and restore hidden and neglected relics of urban heritage. Earlier, in 2004, a L'UX related group, "La Mexicaine De Perforation" was 'caught' on the operation of entertaining a clandestine cinema in a space underneath the Palais de Chaillot on the Place du Trocadero in Paris. The Palais de Chaillot also houses the Musée du Cinema. Now there's a book, "La Culture En Clandestins L'UX'". Lazar Kunstmann, spokesman for L'UX and author of the book talks about 25 projects. 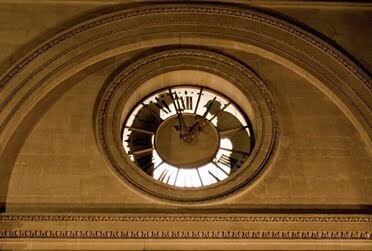 From the start of the organization, the founding of the cinema, the repair of the Pantheon clock and the process. 25 years clandestine cultural action ... sounds great!